Blogs, Blogging and Search Engine Optimization (SEO) are my bread and butter and have been for quite some time. This is a very demanding profession that requires constant updating but also a critical and open approach to methodology: the only way to put yourself in discussion is confrontation by reading what others have to say, so Blogging tips by Lorelle VanFossen was an obvious purchase. The book is a good read for anyone interested in blogging and seeking advice on blogs and how to blog. If you are an experienced blogger it’s just as good a read. It’s more than a book – it’s a handbook, a sort of user’s manual for the blogger, clearly spelling what you should do and how it can be done. It’s quite clear that I liked the book and by the way there is no commercial affiliation or underground agreement between us – I read the book and I liked it. As an experienced web marketing blogger I find room for further considerations on the section Blog SEO and PageRank of Blogging Tips. Lorelle makes a valid point by suggesting to avoid SEO companies promising overnight miracles for a handful of dollars: it’s a long way up to the top of the charts for those ever more competitive keywords. People will resort to just about anything to get there – if you want to do it the right way it will take time and lots of effort. Without competence you cannot become an authority, if you’re not an authority you won’t acquire visibility and will remain in the dark. So in essence, at the end of the day, it is up to you, your capability and the amount of effort you are willing to pump into your blog to see the results. But if someone is there to help you’ll avoid a lot of errors. Just think about the hundreds (if not thousands) of plugins (I’m thinking WordPress) of additional functions that are available online today. I review nearly 300 posts per day on new WordPress Plugins, bookmarking (and sharing) the most interesting ones. If you have no experience it’s difficult (to say the least) to identify stable optimal plugins to do your job. Each and every blog is different with different needs – an experienced professional will listen to you talk through your plan of action, and suggest an array of features that best fit you needs. Here’s a tip I want to share with you that came to mind reading Lorelle’s book – moving your content towards the beginning of the page. If you use a double sidebar template you’re pushing your content down beneath the first sidebar and you’re presenting the search engines with the same initial content on each and every page of your blog. I have seen blog traffic increase (nearly over night) by 20% by simply rearranging on page elements. There are many other aspects like this someone experienced will pin point, bring to your attention and find an adequate solution. You might say: "Ok but all this is out there on the web all I need to do is read up on it and I’m ready to go – I don’t need any help … "
My answer to that is a simple consideration about cooking. Anybody can get their hands on a recipe to make spaghetti, so can I. Actually, being Italian, I don’t need to, I know all the ingredients off by heart but I’ll never beat my wife in the kitchen. Same goes with SEO – experience, competence and passion make the difference. So If you’re serious about your blog and want a foot hold in the web 2.0 arena an investment in professional help is a good start: Like Lorelle says avoid the businesses used to selling snake oil. Oh and another tip to make things easier for you – BlogDesk. You’ll blog much faster, avoid useless (lengthy) user sessions on your blog and have seamless blog posting at your finger tips but I advise you to … well know don’t expect me to tell you everything right here and now ! Sorry again about the book order. I’m glad it finally arrived. Luckily, few have that problem. Thank you for the kind words. 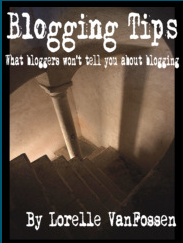 I wrote the book as a “tip list” rather than a full out discussion by chapters on blogging. I wanted people to go “down the list” and check off each point they’ve done or checked on their blogs. It’s a fast “read” and a workbooks to keep by you when you’re working at improving your blog. How do you know what your web design or WordPress Theme looks like under the hood? View the source code and look. What comes first in the order of the code. That’s what search engines see. They don’t see the pretty. Few people pay attention to this any more when covering SEO, but it still has great value. If a search engine web crawler only scans the first third, half, or even 75% of your page and leaves, the farther your content is down the code, the less original content, as you say, is added in. Thanks and I’m so glad you enjoyed the book. Thank you for pointing that out Lorelle. People often forget to really look under the hood of their WordPress Theme before deciding permanently on it. the book looks like its worth the purchase. i followed the wordpress blog link. i saw a shot of a page and it had very interesting points. one of them being ” dont waste ur words” and “explain the jargons”. thanks for suggesting such a nice book. I appreciate and respect the information available online from folks who because of personal experience really do know what they are talking about when they post. I’m new to blogging and frankly, I am so very glad to be able to work at home now for many reasons. The book you reviewed sounds like an important tool, especially for a newbie like me. I’m interested in helping others in situations such as mine be able to find a free legitimate work from home job. Sounds like a really good book for bloggers. I’m just looking into starting a blog and I’ve been reading up a lot on the subject, thanks for one more possible resource. How can you go wrong when learning from people who really know their stuff? no doubt SEO has become very competitive and one of the fastest growing sectors. but it come with its own share of problems like any other sector. the buzzword here is CAUTION. Thanks for your nice tips .I like it..Keep posting. There is nothing important like an idea in the world.Thanks for your tips. Thanks for sharing this book.Its really nice.We will able to get many idea from this book. A nice tips have a great power of change many thing.Thanks for sharing this nice book.I will read it for improve myself. Nice book and I am gonna purchase it. It is damn good on all about Blogs SEO thingy. Hi… got some great tips and I have put this book on top my “Must Purchase Books”. Thanks for sharing this with us. Thank you very much for the tips. Even I noticed many times that a small change can do a lot.. You can really increase your traffic if you are bit careful about your content and placement of things.. The book looks worth buying. Thank you for giving us an idea of it and suggesting a good book. Thanks for this.I will buy this tape. Thanks for the tips and the book. Hope that it will give me some valuable information.